My wife and I didn’t like the aft bathroom layout when we bought the boat. It was very nice to have an en-suit bathroom from the aft master cabin, but for some inexplicable reason the washbasin had been built into the bedroom, not the bathroom. This completely obstructed the person getting in and out of bed on the port side. 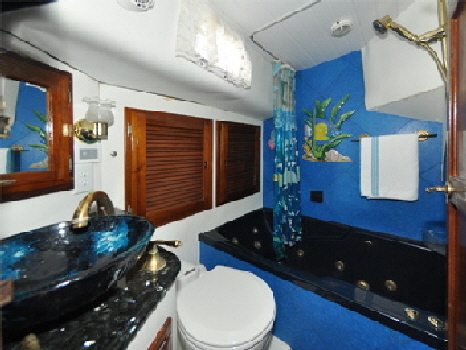 The layout mystified me, I have never seen an aft cabin and large bathroom where the wash basin is installed in the cabin, not the bathroom. There were a few other things we didn’t like as well, like the small wedge shaped built-in bathtub and the old fashioned manual pump-out head. I decided to undertake a complete remodeling. I first dismantled the cupboard and wash basin in the bedroom and cut its bulkhead down to the bed level. This immediately enabled my wife to get out of bed without disturbing me. 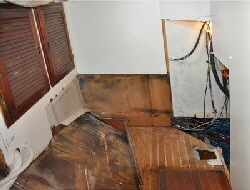 I then removed the bathroom door and its bulkhead with a view to relocating it at an angle, to allow room for a wash basin to be built in the bathroom, like any normal layout. I pulled out the old leaky manual toilet with its exposed pipework and threw it all away. Then I had to set about removing the bathtub, which was neither one thing or the other and no use at all for a six footer like me. I thought this would be a matter of just quickly cutting it out. Au contraire! it turned out to be an unbelievable structure, three thicknesses of 3/4 inch marine plywood sandwiched between glassfibre and resin! It had to be chopped out with an electric saw, bit by bit and each lump lugged to the dumpster. The whole lot must have weighed something like 300 lbs and I imagined the boat coming up three inches on her marks. I went though five heavy duty blades! After two days the old bath was gone, and the complete bathroom was gutted down to the floorboards. While the bathroom door and bulkhead was out of the way there was plenty of room to bring in the new tub into the bathroom. 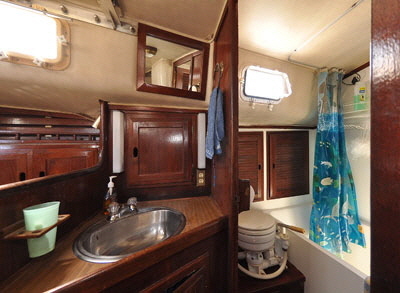 This was a regular full size bathtub, which I bought from a local supplier, but I had to saw 1�” inches off one of the side flanges—not to fit it in the bathroom—but to get it down through the companionway into the saloon. It was then manhandled along the aft corridor, round the bed and into the bathroom. Once in it plonked down exactly where I had planned it, even allowing for four inches of extra length, which slid into the neat alcove I pinched out of the engine room. Domestic house tubs are filled from the house hot water supply, but there wasn’t enough water in my boat’s six gallon hot water system to warm 55 gallons with hot water. I had previously installed a second 120 volt shore power cable, primarily to power two air conditioners and by combining the two 120 volt inputs with a double pole breaker I obtained a 240 volt supply to power a water heater. This heats the bath water to 103 degrees Fahrenheit in less than one hour. It took longer to ‘trim’ the bathroom than to fit the equipment. I used a fascia of blue vinyl tiles and also installed a new headliner. The headliner was plastic (PVC) tongued and grooved panels called plank paneling used as waincote panels on house walls from Lowe’s hardware store. Each board is 7 inches wide and � inch thick and available in 8’ feet long boards. I also wired in two 120 volt sconce lights from Home Depot and two extra 12 volt ceiling lights. I found an oval painted glass picture of a square-rigger on Amazon.com, which I inset into the alcove with a light behind it. After a lot of thought about “electric or manual” I bought a Raritan Elegance electric head and installed it next to the bath. I piped it into the shore side fresh water supply by using none return valves which ensured it remains totally isolated from the boats fresh water tanks. Fresh water flushing totally eliminates odor and keeps the bowl cleaner. When at sea the toilets can be switched to sea water flush, to save potable water in the tanks. Installing the head was the usual struggle with 1�” pipes, but only because I did not want any of the pipework showing in the bathroom. I hate to see marine heads with exposed pipes and valves, when with a bit more effort they can usually be enclosed. Direct toilet discharge is illegal anywhere in American waters, so most boats have holding tanks. We had learned from the initial survey that the large aluminium holding tank in the bilge—which was supposed to serve both heads—was about as efficient as a colander! It had to go, so it was chopped out in five hours of very messy work. We went through ten die-grinder cut-off blades and finally wore out the grinder itself, when it started to smoke. The only consolation was, I did get $50 for the aluminum from a recycle plant. I hate holding tanks, which nearly always smell, so I replaced it with a Raritan Purisan waste treatment system which injects chlorine into a tank and neutralizes the waste. This is US coastguard approved and quite easy to install if you have room below the level of the head. I now use the space where the holding tank was for storage of spare mooring ropes and lines. With the toilet in position and working, the next job was to install a new wash basin and faucets. The original ‘stainless’ basin was stained and old fashioned. I bought a basin called a vessel bowl from the local do-it-yourself store, which sits on top of the counter, not recessed into it. This concept allows for a larger bowl than one that is recessed. They are made of thick molded glass and available in many different colours. I bought a beautiful blue and black bowl, with polished brass handles and spout. I rebuilt the pedestal on a split level configuration using two shaped pieces of blue/black granite counter tops with holes to accept the taps and spout. The whole room was then re-clad with clean white plastic sheet and caulked to make it waterproof. All this took the best part of two months to completely finish, but the result is a beautiful bathroom, reminiscent of some elegant Victorian yacht. It is absolutely marvelous to be able to soak in the bath after a hard days work on the boat, especially with a pint of Boddington’s pub ale which fits in the folding holder on the wall. I haven’t yet used it anywhere other than in our marina berth, where the boat hardly moves. Trying the have a bath at anchor could be interesting, when a passing motor boat causeautomatic pump-out sump..